Q. I have a new house decorated in all neutrals. I love the clean, new look, but now I’m bored. I want some pattern and color. My husband “borrowed” some paintings and decor from his mother’s house to let me experiment. She has good taste, but everything looks like it needs to be in her house. I’ve been looking at magazines, and it seems like anything goes! A. Sure! Expressive rooms may look spontaneous; but when you look closer, you will usually see parameters or an underlying structure. 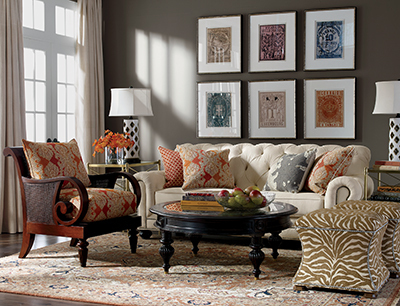 We will look at two gorgeous, complex examples courtesy of Ethan Allen and then make an easy formula. Do you get the sense that the designer traveled the world and brought back wonderful things that magically went together? She planned that. Next, she chose a range of color and style and then selected pieces within that range. The lamps display the key to the scheme. The range of tone: all the way from white to black is identified in the lamps, walls, and draperies, so the accent pieces can incorporate any tone of white to black with harmonious effect. The mode ofpattern is clear too: simple, somewhat organic forms arranged in a geometric grid. No one piece contains more than one color. Even the rug follows this rule. Building a united whole out of seemingly unrelated parts is a modern way to decorate similar to modern art. The second example is even simpler to analyze. All of thepattern is large scale. Each textile is isolated on one piece of furniture. 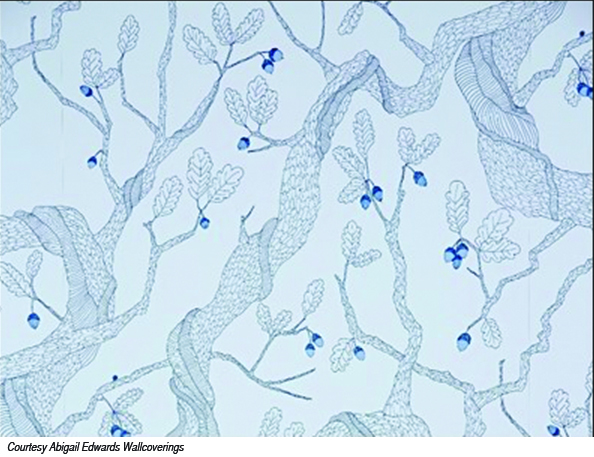 Within each piece, the pattern runs freely, but the color and tonal range are held tight. Even the plaid chair conforms to this rule. 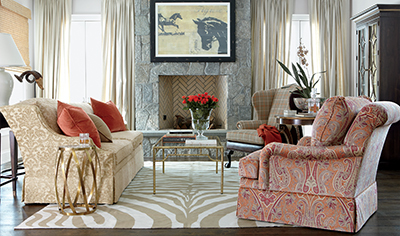 Burnt orange accents are the only items that “link” the room together. This approach might be compared with a symphony with each furniture piece representing a different category of instruments (wood, brass, strings). The whole impression is defined by color. The intricate richness is created by the pattern within each piece. So, we have identified the major scheme. Next,let’s look at what makes it beautifully finished: the patterning doesn’t stop with the major pieces. The herringbone brick in the fireplace, stone wall, geometric tables, textured shades, and geometric cabinet doors all follow the same plan. If you begin with any range, rule, or scheme, be sure to carry it all the way through. So here is your formula: identify a tonal range (light to dark), a color range, a range of pattern scale, and type of motif. Make sure every element added to the room adheres to the ranges of at least 3 of the 4 predetermined ranges. Here is one more hint: it is easier to successfully create drama with one of the 4 ranges when you make the ranges of the other three smaller. An easy example is this lovely Asian inspired wall covering. Only pattern and the color blue is used. This can be added to any neutral area with success. Start with a small, isolated room for your first project, and move to the living room after you have developed some opinions and confidence in your approach. Note: We welcome all questions related to home design—ask us about color, room arrangement, planning for a new home, selecting furnishings, lighting, flooring, and more. Answers provided by Tanna Espy Miller, B.F.A., M.B.A., who has operated her award winning interior design practice DesignNashville.com for 26 years.You may also contact Tanna at 615/ 601-0552.